Imagine this on a cold night, the aroma running all through the house when you open the door from being outside. 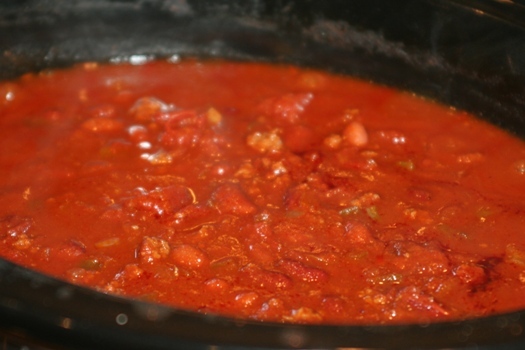 As you walk in, the house is cozy, and there is this big pot of chili sitting right there waiting for you. This recipe is that easy. I put it in my crockpot on high for 4 hours and just let it simmer. Man, is it good! When I was little, my dad took me on my first plane ride to Cincinnati. He had extra frequent flyer miles that were expiring, so we made a day of it. The memory of that day that stands out the most was the two of us going to Skyline Chili. I think of that day every time I have chili like this. I served this last night to our community group at church and there was not one bit left–and I had doubled it! This recipe is the simplest ever, but it’s especially easy when you pop it into the crock pot. It’s great for entertaining too. Adding the spaghetti noodles stretches it to make it a pretty inexpensive meal for a group. Combine all ingredients into a slow cooker or stock pot. Slow Cooker: Cook on high for 4-5 hours, or low for 6-7 hours. Stock Pot: Bring to a boil on high, reduce heat and simmer on low for one and a half hours or more. *Cook's Note: If it is too thin for you, add one small can tomato paste to thicken. Find more Slow Cooker and Crockpot Recipes on Faithful Provisions! We moved to the Cincinnati area when I was in high school, and while I don’t care for Cincinnati style chili, I can tell you it contains chocolate and cinnamon. Yours sounds better to me. I tried to print this and nearly used all my printer ink. The ‘print-friendly’ prints EVERYTHING, including ads, buttons, and everything else on this page. 12 PAGES! Maybe you could trim it down to just the recipe. Love your stuff, but I’ll have to go into debt just purchasing printer ink at this rate – LOL! SB, I copied and pasted the recipe into my email, give me your email and I’ll forward it to you! Chili is serious business in Texas and in Texas chili does NOT have beans. Ever. If you want to have real Texas chili you can try out the recipe used by Lady Bird Johnson, First Lady and Wife to President LBJ. I am going to tell you what happened when my friend from Oklahoma made chili for a Super Bowl party with her coworkers in Dallas. Of course, she included beans, as any self-respecting cook anywhere else would, and the response was immediate and, ahem, vociferous, to use a highfalutin’ word. She said, years later, that she would never live it down. Those people down there are strangely adamant and surprisingly dogmatic about what goes in their chili. If you ask me, safely in Wisconsin, it sounds more like oddly-spiced spaghetti sauce.